Listen, I loved Elizabeth Gilbert’s TED Talks speech about creativity. Brilliant! Inspiring! It’s what convinced me to actually attempt to read her memoir, Eat, Pray, Love. Well, that resulted in my exasperated flinging the book across the room… so, of course when the movie came out on Netflix Instant Stream I had to watch it. Why? I dunno, I’m a masochist, I guess. I only made it a third of the way through the movie before I closed my Macbook and dashed to the store to buy mussels and pasta and heavy cream. Those first 30 minutes of her slurping pasta in Rome to a heavily operatic soundtrack was good for my appetite, but that’s about all it was good for. I picked up two pounds of Taylor Shellfish mussels and 1/2 pound of scallops, linguine, the expensive, divinely smooth organic Fresh Breeze heavy cream, and set C to work on dinner while I languished in hilarious conversation with C and my good friend, the beautiful and spunky Lexi. 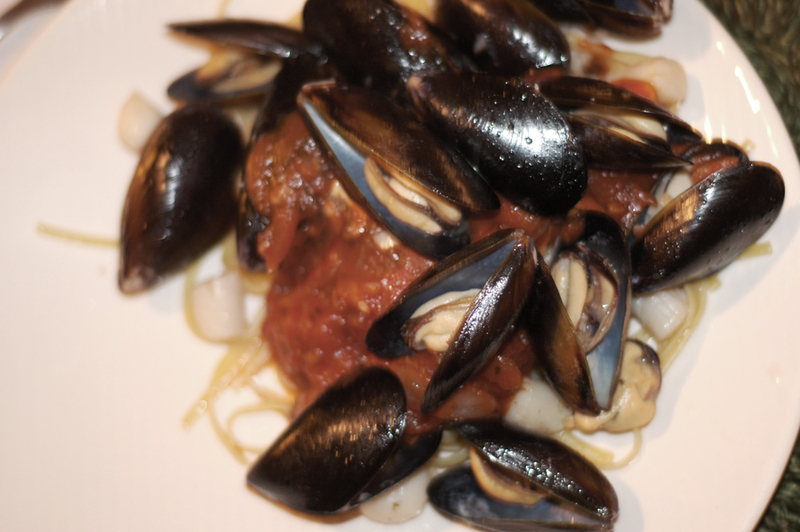 Another friend dropped in at the last minute, and although he’s gluten-free, still enjoyed some salad and a hefty pile of mussels and scallops drenched in C’s marinara. Even though my photographs sucked, even though I don’t have a recipe or anything real to say, and despite the fact that I’ve felt too distracted and uninspired to food-write for weeks now, this dinner brought it back. Good, quality, relatively cheap food. Interesting, lively friends, some music, some whiskey, and a mouthful of shellfish. What more can you ask for to feel rich and supremely lucky? It looks like I have Elizabeth Gilbert to thank for the end of my blog-writer’s block. No hard feelings on the book… it just wasn’t for me. But damn,woman, you sure know how to make a lady crave pasta!